The Blues With More Rhythm Than the Average Catholic! I first discovered Paul Lamb when we were both many years younger than we are today. He was the harmonica player in the greatest Blues band Newcastle ever produced – The Blues Burglars; and it’s your loss you never saw them on a Friday night in the Broken Doll. Eventually Paul packed a holdall made off to seek his fortune in that there London Town. I’m not sure if he has attained the riches his talent deserves but he’s certainly made some amazing albums in the intervening years and at one stage appeared to be keeping the Blues alive all by himself. 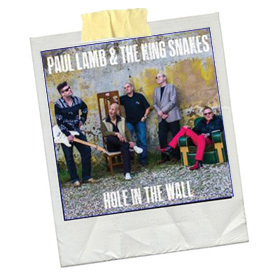 If I’ve done my maths correctly this is his 15th album with (or without) the King Snakes and while I may not have heard them all; could easily be his best as the production qualities are superb. Opening with the rip-snorting title track; featuring Chad Strentz’ distinctive voice, Paul’s funky harmonica and a band as tight as a ducks bum the party starts in earnest. While the rakishly handsome Paul Lamb is the frontman; the band actually revolves around Strentz’ deep and reverberant voice, which could only ever be destined for the Blues. Hear him on Way Down Low and/or A Better Place to Be to hear what I mean. Lamb is no slouch himself in the singing department, and sings a few songs himself; with his version of the Miracles hit You Really Got a Hold On Me taking it way beyond Detroit and back into the Delta. I can’t go any further without mentioning the searing and soaring guitar of Ryan Lamb, Paul’s son. It must have been a daunting task joining your Dad’s band, especially in a very critical industry but he more than handles his role well and will surely be joining his Dad on the Awards circuit very soon. Favourite track? I’m not really sure as my favourite three tracks are entirely different; proving the King Snakes have depth and range to their talents – the instrumental Mr. Lamb’s Groove Walk is a peach; allowing each member a slot in the spotlight, Jumpin’ Little Judy is a hot dance tune for which the band are quite rightly hailed but the album closer the timeless Still Got the Blues For You is as good a Blues Song I’ve heard from a British band in the last twenty years. OK, critics may say there’s nothing new here but that’s not fair; as Paul Lamb take the Chicago Blues template and blow the dust well and truly off it but keep everything to ¾ time and make music that will still sound as fresh in 50 years time.